Ever since Do Ho Suh left his native South Korea in 1991 to study at the Rhode Island School of Design, he has made displacement — cultural, physical, psychological, architectural — one of the central themes of his work. He created a replica of his childhood home in sheer silk, suspending the phantom structure in midair. He cast a version of the mansion-turned-apartment building that he moved into in Providence in greenish resin, splitting it into quarters and pulling them apart to expose the form's domestic guts. And he created an installation, shown at LACMA in 2009, in which a miniature version of his traditional Korean house appears to have crashed into the side of that apartment building, which is splayed to reveal disturbances within the minutely detailed interior. Suh titled that piece "Fallen Star 1/5," to recall the feeling of landing in the U.S. for the first time, of being "dropped from the sky." Now, visitors to one of Suh's works will be able to experience that sensation for themselves. 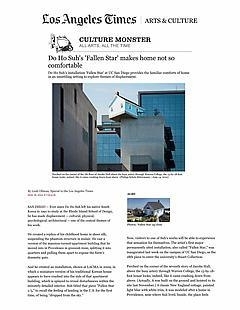 The artist's first major permanently sited installation, also called "Fallen Star," was inaugurated last week on the campus of UC San Diego, as the 18th piece to enter the university's Stuart Collection. Perched on the corner of the seventh story of Jacobs Hall, above the busy artery through Warren College, the 15-by-18-foot house looks, indeed, like it came crashing down from above. (Actually, it was built on the ground and hoisted to its site last November.) A classic New England cottage, painted light blue with white trim, it was modeled after a home in Providence, near where Suh lived. Inside, the place feels cozily lived-in, a quilt draped over one chair, the couch scattered with throw pillows. Newspapers and an open bag of candy clutter the coffee table. A child's drawing is pinned to one wall, near an array of old cut-paper silhouettes. Near the door hangs a small needlepoint of a house, an image of domestic serenity. This home too feels like a place of refuge, passed down through the generations — except for the fact that it rests at a stomach-flipping tilt and hangs over a daunting drop. "The slope of the floor is only five degrees, which is not that much," Suh says, seated on one of the Adirondack chairs in the quaint garden leading up to the house. It's enough, however, to disturb the body's natural equilibrium, and most visitors will reflexively grip the door frame as they enter. "But then everything you see is something you're familiar with from your own home or your parents' home or your grandparents' home. You physically experience this instability while you're surrounded by elements you're so comfortable with. I think this actually helps the audience start to think about their surroundings." Works in the Stuart Collection typically have long gestations, and it took "Fallen Star" seven years to come to fruition. When Suh, who is now based primarily in London, first came to UCSD to develop a proposal, he was interested in designing something on the cliffs nearby, intrigued by their emotional proximity to Korea, with only the Pacific Ocean in between. He shifted his attention to a site on campus, but "it never left me, the idea of a house dangling, holding onto the cliff." A bit like a birdhouse, with a view over the top of a eucalyptus grove, the house even has a contrived address: 72 Blue Heron Way. Suh also envisioned a house lodged like a barnacle on the side of a building, with their interiors continuous, the domestic and institutional spaces connected. "When our advisory board saw [that] proposal," recalls Mary Beebe, director of the Stuart Collection, "they said, 'Go for it,' half-jokingly, like 'We dare you to try to do this.'" She laughs, nodding to the steady stream of students, faculty and enthusiastic locals lining up to see the piece on opening day. "And here we are." The project, as it was ultimately realized, represented a formidable challenge, appropriate to the engineering building upon which it rests. "The deans of engineering have always been really great to us," Beebe says. "We see them as companions in adventure now." Tim Hawkinson's giant granite "Bear" was installed in 2005 in a courtyard of engineering buildings nearby, and Bruce Nauman's neon "Vices and Virtues" (1988) wraps around the upper perimeter of a structures systems laboratory close by. In homage, framed photographs of three UCSD engineering deans, as young boys, adorn the mantel of "Fallen Star." The collection is named after founding patron James Stuart DeSilva. The new project cost just more than $1.4 million, all raised from private sources except for a $90,000 grant from the National Endowment for the Arts. Beebe is especially proud of how many small donations came in from current and former students, as well as Stuart Collection supporters around the country. "Fallen Star" is open to the public (accompanied by a docent) Tuesdays and Thursdays. Though the work is finally completed, it will not remain static. Interior lights will turn on and off — on a late-night, student's schedule, perhaps — and steam will rise sporadically from the chimney. The landscaping will continue to evolve as well, since the garden is filled with East Coast varietals, which might not thrive on unfamiliar turf. "That's part of the project, part of the process," Suh says. "It's part of the survival issue that all of the students have to deal with, on the campus, in a milder way."